I had like ten but I'm blanking. 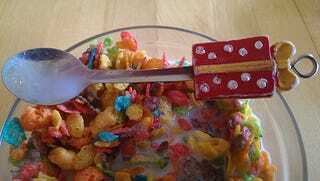 Here's the spoon my daughter insists on eating her breakfast with. Beautiful. Uh....jeeze. I think TUT infected me with "can't think." Seriously here....I woke up and had 3 good questions. Oh oh ok I just thought of one that I can tie into the picture. My daughter (sorry Jolly, I'm one of ....those), likes to eat a mix of two cereals. Here we have fruity pebbles and captain crunches Halloween crunch. She's going to be with my mom all day so I figured I'd sugar her up beforehand. For the record I hate mixing cereal, the two textures colliding is rarely good. What's a good mix of two genres that you thought would probably be terrible and then either were or weren't? Did the melding of rhythm game and shmup make you see the world in new drug laced colors (Rez)? Did Japanese mythos x zelda make you rethink how beautiful a game could be (Okami)? Or how about an on rails shooter with a political intrigue plot and....monsters....and split personalities....and anime...and...uh...what(Killer 7)? Or just things in daily life. Did Car + Nitro boosting = Your secret to success? Did Peanut butter and jelly rock your world?